Ben Bernanke (Reuters): "Interest rates are low because our economy is still in a fragile recovery," Bernanke told a town hall meeting in Washington with educators. "Lower rates are intended to restore more normal levels of employment and growth." That may be true, but on average a prolonged low interest rate environment has been hurting US households. Here is why. Many economists point to the household debt-service ratio as an indication that low rates are helping consumers. The ratio has declined from the "bubble" years - roughly to the level it was in the 90s. It is true that one reason for this decline is the drop in interest rates (lower mortgage payments for example). But it's not the only reason. The US consumer has deleveraged considerably since the financial crisis, reducing debt levels (lower credit card balances for example) and therefore lowering the debt-service ratio. This component of the reduction has nothing to do with lower interest rates. 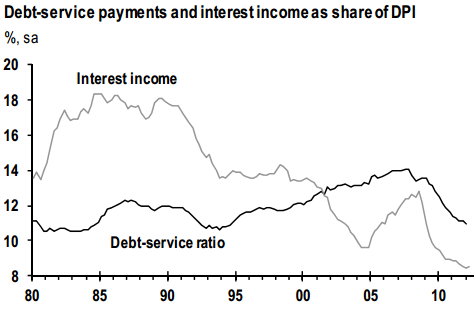 Interest income as a percentage of disposable personal income (DPI) on the other hand had declined dramatically, far outpacing the decline in debt-service ratio. Consumers are not benefiting from the lower debt burden because their savings accounts are not paying them anything. 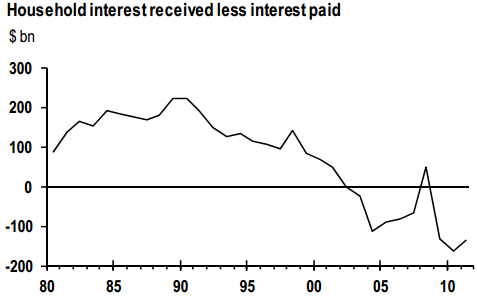 In fact net household interest income (interest received less interest paid) is near record lows (negative) in dollar terms. That's money coming directly out of US consumers' pockets. A key negative side effect of persistently low rates on households is the delay of retirement. This inability of many Americans to retire on their savings because of low rates is keeping them in the workforce, limiting job opportunities for younger workers. 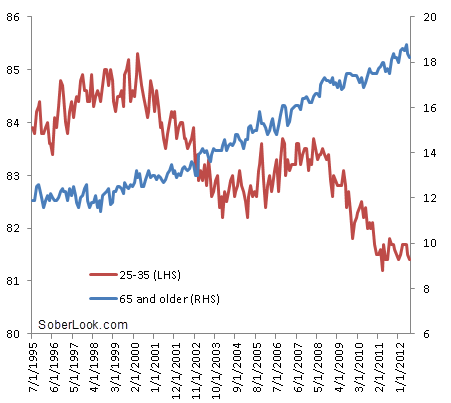 In fact this increasing number of older participants in the workforce, likely at the expense of the younger workers, is visible in the labor participation rates (broken out by age). The low rate environment is not the only factor in the delay in retirement, but its impact is unmistakable. Blake Hurst (the American Enterprise Institute): - In a recent Wells Fargo/Gallup survey, one in three investors report that low interest rates have forced them to delay retirement. Forty-two percent of people now investing say that low rates have made them doubt that their retirement savings will last as long as they will, and nearly 40 percent of retirees report reduced consumption because of low interest rates. It is true that some households have been helped by record low mortgage rates. But on the whole, the consumer is worse off in a prolonged low interest rate environment. Therefore keeping rates low over the next few years is by no means a riskless strategy for the Fed, requiring a thorough cost-benefit analysis. There is no question however that the costs to US households will be significant.